Select "bus check" from the "obd / mobd menu" screen. The ecus and sensors that are properly connected to the can communication system can be displayed using the intelligent tester via can vim. Press "enter" on the intelligent tester via can vim. The screen displayed the ecus and sensors that are properly connected to the can communication system. 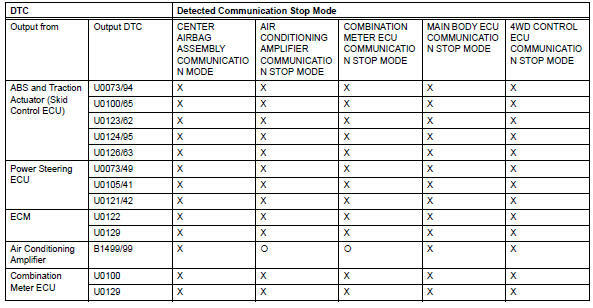 There is a communication stop in the system of any properly connected ecus or sensors that are not displayed (see page ca-10). System (ecus and sensors) that use can communication vary depending on the vehicle's optional settings. Check which systems (ecus and sensors) are installed on the vehicle. In the can communication system, can communication system dtcs output by the ecu can be displayed by using the intelligent tester. If can communication system dtcs are output, the trouble cannot be determined solely from the dtcs. Perform troubleshooting according to "how to proceed with troubleshooting" (see page ca-8). Air conditioning amplifier for vehicle with air conditioning (automatic air conditioning system and manual air conditioning system). For vehicle with 4wd only. The center airbag sensor is connected to the can communication system but can communication dtcs are not output. 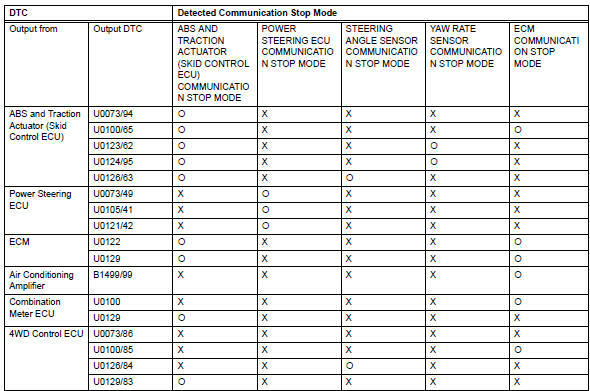 Check the stop mode by using the results of the bus check for the center airbag sensor (see page ca- 69) and main body ecu (see page ca-64). Perform troubleshooting according to the combination of dtcs output.